In an area where trash and broken glass litter the sidewalks and graffiti-covered buildings are boarded up, it is hard to imagine a big, beautiful garden full of fresh produce. However, in inner city Cleveland, through the collaboration of the Ohio USDA Natural Resources Conservation Service, Ohio State University Extension, a push from Congresswoman Marcia Fudge, partnerships between the City of Cleveland and multiple organizations, this has been made possible. The Cleveland High Tunnel Initiative was started as a pilot project by NRCS in 2012 to provide an opportunity for Cleveland residents and organizations to receive funding for high tunnels over gardens. High tunnels trap heat under a polyethylene cover allowing plants to grow longer, in some cases year round. Traditionally, these structures are hoop shaped, but in Cleveland they use gothic style architecture with pointed ceilings to prevent damage from the heavy snowfall that plagues the area every winter. There are approximately 28,000 empty lots within the Cleveland City limits. In many of these areas there are no grocery stores and no places to buy fresh food. According to the USDA, 25% of Cuyahoga County residents live in “food deserts,” defined as low-income neighborhoods a mile or more from grocery stores. In Cleveland, half of the population lives in a food desert, with the closest sources of food being fast-food restaurants and convenience stores. It took some time to get this Initiative started, according to Terry Cosby, the State Conservationist for NRCS in Ohio. Cosby said that the hardest part of starting the Initiative was reviewing the many rules and regulations of both the City of Cleveland and the Farm Bill. At the end of the 2015 Federal fiscal year, the Initiative had been used to build 47 high tunnels, with 35 scheduled to be built and 13 high tunnel contracts pending completion. The goal is to have 100 high tunnels erected by the end of fiscal year 2016, which is very possible as the Initiative has generated a lot of interest. The Ohio NRCS hosted a Cleveland High Tunnel Initiative tour for other NRCS State Conservationists and staff from nine states in April. The tour began at the Ohio City Farm, operated by Refugee Response, a program that helps refugees from war-ridden countries such as Burma, Bhutan, the Congo, and Somalia, adjust to life in the United States. Ohio City Farm is the largest continuous urban farm in North America, stretching six acres. In addition to typical produce production, they also grow hops for local breweries, and practice new methods of micro-irrigation. In addition, the farm is working on a pollinator project and a cover crop project. They’re also practicing traditional horticultural methods such as the use of manure and organic compost to fertilize their crops. The refugees participate in an educational program that teaches food science, horticulture, business and agriculture. They sell directly to restaurants and have their own market stand. The high tunnels in Cleveland have helped communities and families grow stronger. Experienced gardener Avon Standard received the first high tunnel funded through the Initiative in 2012. Standard uses his high tunnel to grow fresh food for his family and to donate to his neighbors. “When I work, I work for my family and anyone around me. If they need something, I get it to them. I plant the seed, I watch it grow, and that’s what I like about the high tunnel,” Standard said. Jamal Rahkeera is another Cleveland High Tunnel Initiative participant. He uses his high tunnels to grow produce that he sells at his own market and to restaurants. At Rahkeera’s site, a tour participant noticed some tile sticking out of the ground in one of the high tunnels. Rahkeera explained that he contacted Case Western Reserve University for help maintaining higher soil temperatures in his high tunnels during the coldest months. The Engineering department took up this challenge, experimenting with a design based on a low cost, solar powered, sub-surface geothermal heating and cooling system, which they’re in the process of installing and testing. Rahkeera leases the land for his high tunnel from the City of Cleveland and explained that after proving that he’s caring for the land in a productive manner, he may be able to purchase the lot from the City for as little as $200. Rahkeera plans to create his own line of juices next, featuring his produce. Rashidah Abdulhaqq, an outreach coordinator for the Northeast Cleveland Federation of Southern Cooperative/Law Assistance Fund had nothing but positive remarks about the Cleveland High Tunnel Initiative. Lynette Harmon, Cuyahoga County District Conservationist; a representative for Congresswoman Fudge; Rashidah Abdulhaqq with the Federation for Southern Cooperatives Outreach; and boys from the United Youth Co-op includng Calvin Welch, Geavonte Johnson, Justice Barrett, Hariom Barrett, Muhammad Abdul Haqq, and Yusuf Abdul Haqq; and Al Norwood, NRCS urban conservationist toured Cleveland high tunnels this spring. 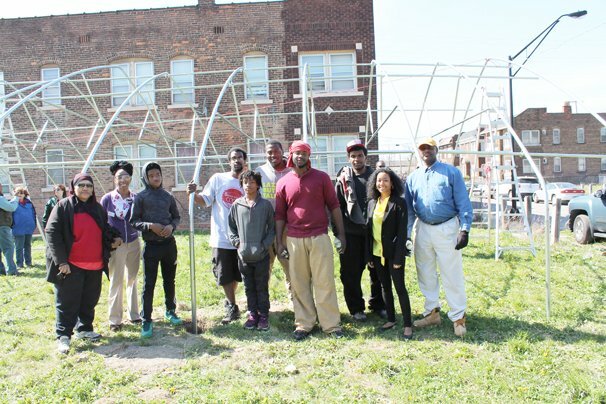 Abdulhaq and the United Youth Corp group credited their successful efforts to Al Norwood, Cleveland High Tunnel Initiative Coordinator, and Lynette Harmon, the NRCS District Conservationist serving Cuyahoga County. The Cleveland High Tunnel Initiative is alive and well. The program will continue to grow, possibly to other cities in Ohio, as well as to other states. The future of the Cleveland High Tunnel Initiative is a glimmer of hope and brightness for those that call even some of the tougher parts of Cleveland home.